In the second edition of the “Boston Public Market Seasonal Cookbook” the staff has assembled recipes using local and seasonal ingredients found at the Public Market. Stir up a pot of gingery carrot soup using local carrots, bake a shepherd’s pie, or make sliders with shark fillets from the Cape. In the second edition of the “Boston Public Market Seasonal Cookbook” the staff has assembled inspiring, healthy recipes using local and seasonal ingredients found at the Public Market. “Many of the recipes came from vendors,” says Mackenzie Sehlke, the market’s education director who curated the cookbook. Amid the hubbub of the busy place, you may overlook some of the unique, local items available in baskets or on vendors’ shelves. The recipes help you shop here. For instance, recipes that include red kuri or kabocha squash, or candy striped beets, send you to FoodCares Boston, Siena Farms, or Stillman’s Farm kiosks. If the recipe for peanut butter cups using Dominican dark stone chocolate catches your eye, the chocolate is available at the Taza Chocolate Bar. The cookbook has beautiful watercolor illustrations and offers cooking tips and advice, such as how to change up your pesto recipe using kale stems or carrot tops. 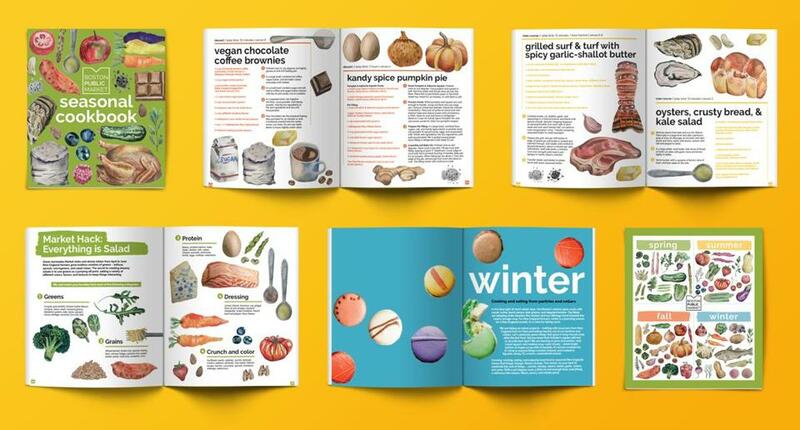 Regardless of where you shop, the cookbook helps celebrate our seasonal bounty. Available for $25 at Boston Public Market’s info desk, 100 Hanover St., Boston, 617-973-4909, www.bostonpublicmarket.org.